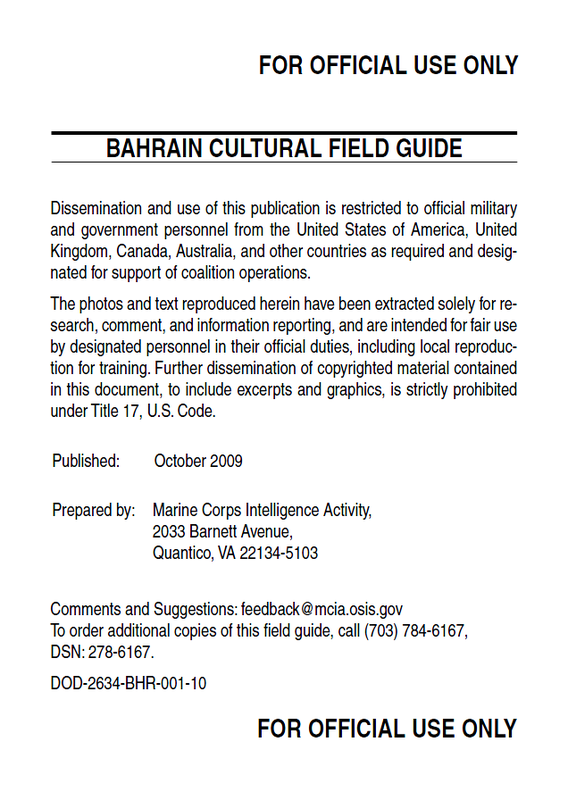 The Bahrain Cultural Field Guide is designed to provide deploying military personnel an overview of Bahrain’s cultural terrain. In this field guide, Bahrain’s cultural history has been synopsized to capture the more significant aspects of the country’s cultural environment, with emphasis on factors having the greatest potential to impact operations. The field guide presents background information to show the Bahrain mind-set through its history, language, and religion. It also contains practical sections on lifestyle, customs, and habits. For those seeking more extensive information, MCIA produces a series of cultural intelligence studies on Bahrain that explore the dynamics of Bahrain culture at a deeper level. Bahrain is an island archipelago in the Arabian Gulf, 15 kilometers (9 miles) off the eastern coast of Saudi Arabia and 18 kilometers (11 miles) north of Qatar. Of the 33 islands that comprise the archipelago, only 7 are inhabited. The largest and most populated of the islands, also known as Bahrain, is home to the capital, Manama, and most of the population. Bahrain Island is 30 kilometers long (18.6 miles) and 10 kilometers wide (6 miles) and connected to mainland Saudi Arabia by the King Fahd Causeway, which was built in 1986. Bahrain’s second most significant island is Muharraq, home to Bahrain’s second largest city, al-Muharraq, and the international airport. The other inhabited islands are Sitra, the site of Bahrain’s oil refining plants; Nabih Salih, an island of date palm groves; Umm Nasan, the private island of the king; the Hawar islands next to the Qatar coast; and Jiddah, home to Bahrain’s state prison. Most of Bahrain is desert, and most of the population lives in the northern third of the country. Bahraini values and beliefs are largely influenced by religious beliefs, the central role of the family, and, for some, tribal culture. Most Bahrainis value hospitality and generosity and are willing to open their homes to guests. Turning away a visitor and not providing a guest with food and beverages are considered rude. Honor is also a key Bahraini value. Honor is typically held by families, and the actions of individuals affect the entire family. A significant aspect of honor is maintaining ascribed social norms governing interactions between genders. By the beginning of the 20th century, Bahrain had a diverse, identifiable population of Sunnis and Shi’a, Persians and Arabs, and urban and rural communities. Sectarian, ethnic, and regional distinctions remain in Bahrain and continue to be factors in Bahraini identity. Oil wealth and the subsequent economic and political development have deepened disparities between social groups and enhanced segmented identities based on class, ethnicity, and religion. Tribal, peasant, and urban communities in Bahrain have distinct lifestyles and identities. Urbanization has not eliminated these communities, which retain their distinct characteristics even as they are incorporated into urban areas. However, distinctions between these communities may not always be clear due to their geographic and economic integration. Most Bahrainis live in urban areas organized into ethnically and religiously homogeneous communities. Urban Bahrainis tend to be more socially liberal; they have the highest rates of education in Bahrain and are more exposed to other cultures. Technological advancements have increased international travel and have given many urban Bahrainis access to the internet and satellite television. Urban Bahrainis are more likely to have a stronger identification with their occupation, education, and residence than Bahrainis in rural or suburban communities. For some urban Bahrainis, kinship ties are weaker because extended families do not reside near each other. Village communities in Bahrain are composed primarily of Shi’a and are bound together through community intermarriage. Urban expansion has transformed many villages into suburban communities. In the face of economic challenges and rapid social change, many village communities have turned inward, and members have a strong and localized identity. Bahraini society is structured around the family. Kinship ties are significant and among the most relevant factors shaping an individual’s identity and place within society. Family structure within Bahrain is diverse and influenced by region, religion, ethnicity, and class. However, Bahrain is a patriarchal society, and many families are dominated by a senior male figure. Hierarchies based on age and gender determine an individual’s position within the family. Children are valued highly in Bahraini society, which has a very young populace. Fifty-nine percent of the population is under 19 years of age. Children enhance their parents’ social status and are expected to provide for their parents in old age. Having children is significant for women, since only through motherhood is a woman able to fully integrate into society. Fertility rates in Bahrain remain high, at approximately 2.8 percent. Bahraini men have more authority than women, and many legal and social constraints have reinforced male dominance. Some Bahrainis believe that a woman’s proper role is as a housewife and mother and do not believe that a woman should be active in society outside the home. Other widely held beliefs are that men are supposed to support the family and that a woman working outside the home would bring shame upon her male relatives. These beliefs have contributed to the low level of participation of Bahraini women in the workforce. However, employment levels for all Bahraini women have risen in recent decades. In 2007, the number of Bahraini women employed in the public sector equaled the number of Bahraini men. However, in the private sector, Bahraini men outnumbered Bahraini women two to one. Some Bahraini women serve as ministers and ambassadors, including Huda Nonoo, a female Bahraini Jew appointed as Bahrain’s Ambassador to the United States in 2008.